I love, love, love it! It is perfect. I wasn't sure how the black outside would look (couldn't tell if it was plastic), but it is a nice black, distressed wood. It is stunning on the wall and seems to keep time really well. I would definitely recommend this clock. Robust, rustic, and artful, this farmhouse clock instantly imbues a sense of nostalgia to your space. The subdued, versatile finish is met with bold Roman numerals for a distinguished look perfect for a variety of home decor schemes. Dimensions 27.5 In. X 27.5 In. X 2.25 In. Beautiful clock! It's more rustic than advertised picture which works great for us. Omg!!! This clock is absolutely fabulous!!! It exceeded my expectations twofold. I hung it above my mantle it is the perfect focal point for the room. I highly recommend this clock, it’s gorgeous. Great looking clock! 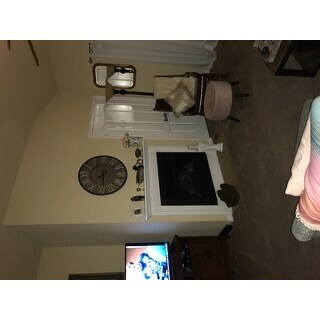 It probably has a little more more a farmhouse kitchen type vibe but we used it in a game room/family room area where I have a barn wood accent wall and lots of aluminum/industrial type accents and it works well! The clock itself was a pain to get working correctly--had to adjust the hands several times over the course of a few days to get it to sync up correctly. Overall its really cool! I can't tell you how much I love this clock! It is way more cool looking than I even imagined from the photo. The style can go from modern to farmhouse because of the materials. You can't tell in the photo, but what I thought was just gray paint, is actually metal and it is awesome! So happy with this purchase! I love this rustic wall clock! It is exactly the wall decoration that I was hoping for. It does not look cheap at all. You will not regret this purchase. Highly recommend! 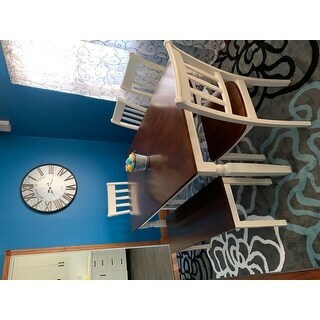 Whole family loves this wall clock! It's rustic and charming, yet sophisticated all at the same time. 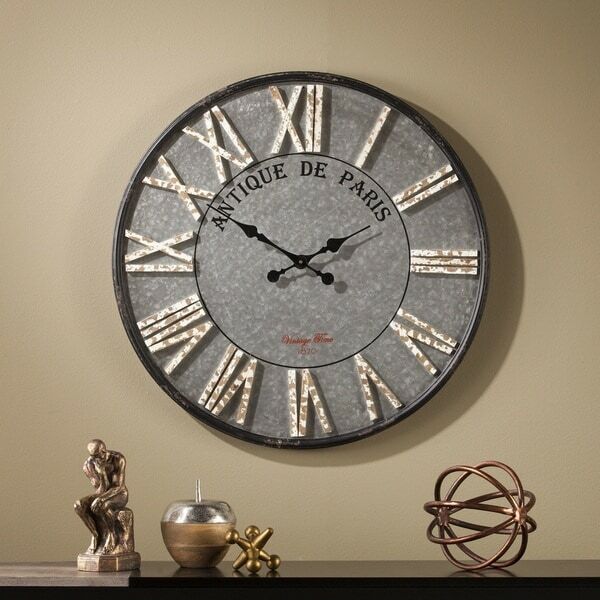 Love the galvanized metal base and the wood Roman numerals. Very sharp. 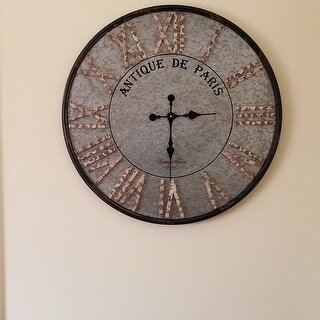 Perfect rustic very big wall clock, and ON SALE! Love it. Came fast! Nice clock but the hands are super thin and flimsy. Have to adjust the hands a few times till time became accurate after installing a few hours. Hangs easy. Might paint the numbers white. Grey is more metal. Overall like the clock. Took a little time to set the hands set just right so it could keep correct time. Overall very nice big clock. Over all its a nice clock. The quality is good. Its bigger then the avg clock. The only negative for me is that the numbers aren't as white as shown in the picture and they tend to blend in. Not quite the quality I thought It would be. I sent this back. This clock is absolutely beautiful! Shipping was fast and assembly was a breeze! I would recommend this clock. I’ve already received so many compliments on it! Luv the size of it! Will fit perfect on the wall space above the ottoman we have for our dining room area. It was shipped and delivered on time. 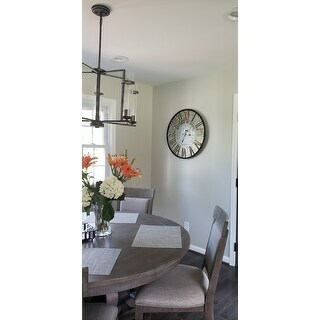 "Is the silent or does it make ticking sounds"
I’ve been searching everywhere for that “perfect” wall clock for our farmhouse! 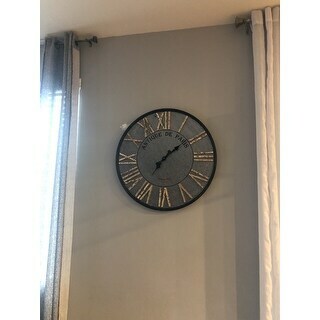 After reading the reviews and loving how this clock looks, I decided it was perfect for our living room! Excited for it to arrive and I will send a picture once we hang it! "What assembly is required for this clock?" This clock features battery installation and wall mounting as the assembly.